From the Chartists backing extended suffrage, to the STUC’s role securing devolution in Scotland, trade unions have long backed reforming the UK’s broken constitution. Now there’s a new frontier for the union movement – shaking up Westminster’s broken political structures. As a trade unionist, it’s clear that the focus of our movement must be putting power in workers’ hands: for economic equality and stronger rights. But it turns out fixing Parliament’s archaic system must be at the heart of that: our economic aims are inextricably tied to political reform. A new report from trade unionists notes that the current first-past-the-post voting system has resulted in a see-saw of majoritarian governments – the Tories have total control, followed by Labour, before power returns to the right. But it is workers’ rights which have lost out in this tug-of-war. The lack of policy stability creates a tug-of-war with our rights and legislation. And it even incentivises parties to create sweeping reforms, setting a new policy direction and going further and faster in the opposite direction. Nowhere is this more evident than in legislation affecting trade unions. Since 1980 there have been no fewer than fourteen employment and trade union acts restricting and then, to a degree, clawing back union rights. But the end result is that we have some of the most restrictive trade union legislation in the western world. Workers are being trampled on by a voting system the political establishment refuses to change. Westminster’s voting system is also bad for equality. Governments elected through proportional representation have better social and democratic outcomes – but the UK’s system by contrast encourages public money to flow to often wealthier swing seats rather than social need. Huge areas are written off by parties as electoral wastelands – with an incentive to direct public funds at a handful of winnable seats rather than towards where the need is greatest – particularly close to elections. Academics have found that central government grants to English local authorities have been greater to local authorities containing swing constituencies than would be expected on the basis of social need and population. Similarly, there’s a clear relationship between areas with marginal seats and fewer hospital closures. Worryingly, the system is becoming more and more biased against Labour, with the evidence set out in a new report from Politics For The Many, an alliance of trade unionists seeking ‘root and branch reform’ of British politics. In contrast, governments elected by proportional representation tend to be more left wing – when every vote counts, all workers’ voices are heard – wherever their votes are cast. Even the right begin campaigning for progressive votes among the majority, rather than carefully crafting their strategy around ‘core voters’ in rich seats. I am co-ordinating the trade union campaign for democratic reform – and I am proud to have support from many leaders in our movement, including Lynn Henderson, who has recently become President of the Scottish TUC, and PCS general secretary Mark Serwotka. 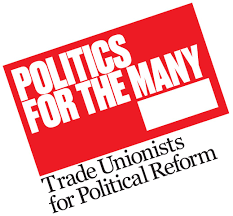 As a campaign group we recognise not only the importance of political reform, but that trade unions have long been at the forefront of demanding changes to the existing system. Today, in 2018, there is still much that needs to be done to enhance our democracy and to make it fit for the 21st century. It goes beyond the voting system to House of Lords reform, ensuring there are fair constituency boundaries and tightening up the free-market rules around party funding. I would appeal to all trade unionists to join what we hope will be an historic campaign – one which shakes up the Westminster model in its entirety. In its place, we must have a fairer way of doing things: to rewrite the rigged rules of the game in favour of workers. One which works towards the inclusion of workers, rather than using us as a political football. Working together, we can create a politics that works for the many, and not the few. To read the group’s launch report, click here.